Horror comics are becoming more and more frequent in our reading culture, and the Ghastly Awards are here to recognize those that shine the brightest. 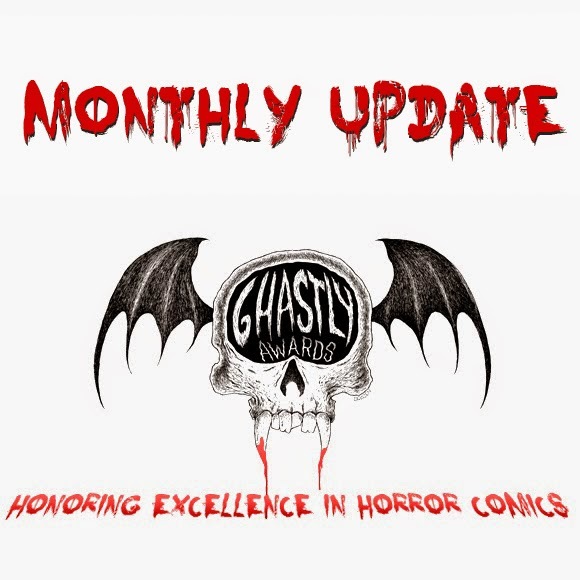 We encourage all Comic Creators to take the time to head over to www.ghastlyawards.com and submit your work for 2014 Ghastly Award Nomination consideration. Loving Dead (Humanoids) - Stefano Raffaele’s touching and gory zombie romance story was originally published in France in 2005 as Fragile, then re-released a few times, even in an English translation as Fragile: Love Never Dies. The time is ripe for another release to cash in on America’s Zombie Craze and here it is. I had missed it before so I’m glad I get to read it and admire the extraordinary artwork but the zombie genre, like me, is getting old and worn. Had I read this 9 years ago when it first came out, I would have adored it! It was fresh and groundbreaking! Sadly, so much stuff has ripped off the concept since (the film Warm Bodies comes to mind) that it weakens my love of the book (and indeed all zombie-culture) now. * Please note that none of the books reviewed are guaranteed to be nominated. These are just books that the Judges enjoyed and want you to know about.